There is a patchwork of codes for hurricane rated glazing. This article looks at the damage that hurricanes can cause, and state codes that address glazing that can withstand hurricane damage. While tropical cyclones and storms are not new, the widespread and increasing amounts of destruction and monetary damages they cause are alarming. These storms can and have hit cities and towns stretching from the Texan Gulf Coast to the northern Atlantic coast states, as well as in Hawaii and American island territories in the Pacific. Local, state and international building codes have adopted standards that work to ensure the integrity of the building envelope during hurricanes and large storms. SAFTIFIRST developed the first ever fire and hurricane rated system that meets the highest code standards without the need for expensive shutters or duplicative fire- and impact-safe windows or curtain walls. Designers now have the ability to use one glazing product that enhances aesthetics and natural light while meeting strict codes and insurance limits. Since 1851, 289 hurricanes have hit 19 Gulf and North Atlantic Coast U.S. states. Three Pacific hurricanes landed on Hawaii and one in California. Of the 289 Atlantic hurricanes, 40% landed in Florida with Texas is not far behind. Hurricanes and tropical storms also hit places that are not among the first to come to mind, such as Providence, Charleston, Mobile, Norfolk, Honolulu and Houston. In fact, in 2013, weather.com included all of these cities as places that are the most vulnerable and overdue for hurricanes. There’s a patchwork of codes and test standards in effect today in hurricane prone regions. The first glazing, hurricane-impact standards were adopted in Florida’s Dade, Broward and Monroecounties (1992), by the Texas Department of Insurance (1998) for 14 Texan Gulf communities, the state of Florida (2001), and the 2003 IBC. The basis for these standards comes from research on Cyclone Tracy that hit Darwin, Australia in 1974, where they found that property damage was a result of wind-borne debris and fluctuating pressures. As a result, hurricane-impact tests cannot be a single gust, but instead must include winds that change directions slowly and carry debris. Most current U.S. codes and standards require that the building envelope be designed to resist impact from flying debris and cyclic, fluctuating pressures. The various tests and standards go by different names, but share concepts. Large and small missile tests. (ASTM E 1886, ASTM E 1996, TAS 201 (Florida), 2012 IBC section 1609.1.2) In these tests and code sections, a 2 x 4 (large) projectile is thrust onto glazing assemblies that occurs up to 30 feet above grade and small, two-gram steel balls (small) are thrust onto glazing assemblies that occurs between 30-60 feet above grade. Test standards vary based on whether or not the projectiles can penetrate and/or break the glass, and by how much. But, generally products should withstand debris impact, in order to prevent wind from entering a building, building internal pressure and destroying property. Design wind loads. (ASCE 7, IBC Section 1609.1.1, TAS 202 (Florida), TAS 203) Most codes refer to ASCE 7 to define wind speeds and wind load tests in hurricane prone regions along the Atlantic and Gulf of Mexico, Hawaii and U.S. territories in the Caribbean and South Pacific. The 2010 Florida Building Code (FBC) and 2012 IBC reference ASCE 7-10 which now uses an ultimate strength design approach to design wind pressure, and the 2010 FBC wind maps are based on ultimate design wind speeds. 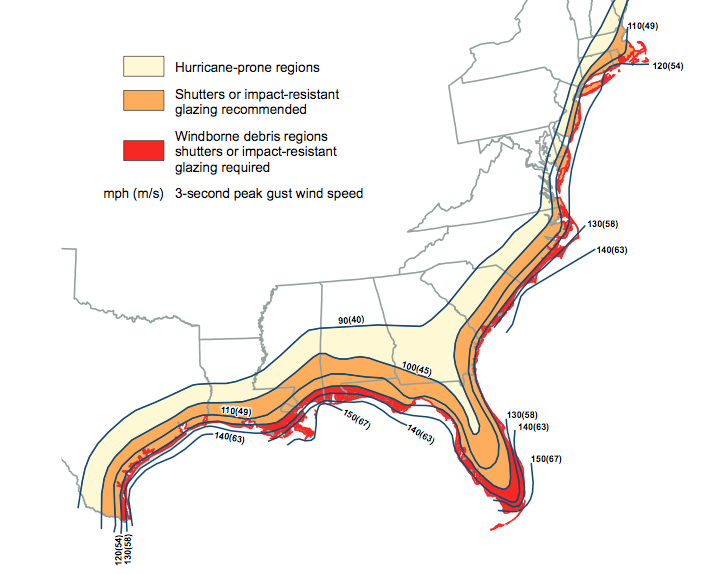 Florida has two distinct regions requiring wind-borne debris protection: High Velocity Hurricane Zones (HVHZ); and Wind-Borne Debris Regions (WBDR). In HVHZ, the entire building envelope must be resistant to wind-borne debris. In WBDR (one mile of the coast where ultimate design winds are 130 mph or greater, and areas where the ultimate design wind speed is 140 mph or greater), exterior glazing of doors and windows must be impact resistant or protected. All building envelope projects sold in Florida must be approved by the Florida Product Approval Program. In Texas, all door and window products sold in 14 designated county coastal catastrophe areas must be hurricane impact tested, certified and labeled. The Texas Department of Insurance offers a product evaluation service. Texas, New York, Georgia, and Hawaii have building codes based on the 2006 IBC. Alabama, Maine, Massachusetts, New Jersey, North Carolina and Virginia are examples of coastal states that use the 2009 IBC. Under the 2006/2009 IBC Wind-Borne Debris Regions, exterior glazing of doors and windows shall be impact resistant or protected with large missile protection below 30 feet and small missile protection above 30 feet. Louisiana, Mississippi, Rhode Island and South Carolina are examples of coastal states that have adopted the 2012 IBC, which redefines a Wind-Borne Debris Region more broadly than the 2006 and 2009 versions. The 2012 IBC continues the requirement that exterior glazing of doors and windows shall be impact resistant or protected with large missile protection below 30 feet and small missile protection above 30 feet.